Michael Hancock, mayor of Denver at the event. Panasonic Corporation put the limelight on the shape of things to come in homes of the future at a major global consumer electronics and technology trade show held last month (January 6 to 9) in the US. The global electronic technology leader showcased its Smart Town concept at CES 2016 in Las Vegas, along with its latest products, solutions and technology. The Smart Town consists of four areas: Smart Home, Business/Retail, Mobility and Stadium, says a spokesman for the company. In the Smart Home category, Panasonic showcased consumer electronics for the kitchen and living room under the theme ‘Better Living Tomorrow’ for the near future (around 2018-2020). Visitors also found the latest products in the DEN (entertainment space), bathroom, home office and creative garage, in addition to related products in the Green Energy and 4K corners. In the kitchen space, Panasonic showcased advanced appliances such as a free-style induction hob and cordless kitchen appliances, as well as connected home appliances with cloud-based services. Meanwhile, in a mock living room, Panasonic showed off a transparent LCD display that seamlessly blended with the décor. The screen could shift between “transparent mode”, where you could see the shelving behind it, and “screen mode”, where the screen portrayed different scenes. Built into the carpet of the living room were speakers that allowed sound control. In the Home Office area, visitors found Panasonic’s easy-to--use home monitoring system that works in sync with a smartphone. The Rulo robot vacuum cleaner introduced last year in Japan was also on display. The company also introduced the concept of Ora, smart home and smart building solutions. The flexible software platform enables integration of all endpoints in a household into smart living experiences. Other key areas of its home section was the Creative Garage, which included an in-house garage that doubles as a hobby room. Panasonic also proposed its concept for a society utilising advanced technology and solutions, through the settings of Station and Premium Department Store, as well as the technologies behind them. Panasonic put the limelight on its informational digital signage and multi-language-support Light ID solutions that can help people at a busy station. Other solutions ensuring safety and security shown in the station backyard setting included a network camera that can monitor 360-degree views and provide images with resolution higher than 4K, bone-conduction headphones and a noise-cancelling microphone. It also presented solutions to protect Internet of Things (IoT) devices with limited CPU resources from hacking, using its own cybersecurity measures. Meanwhile, in a high-end department store setting, Panasonic showed how windows that use its transparent screens, high-speed projection mapping system and digital signage can help create a sophisticated new look. 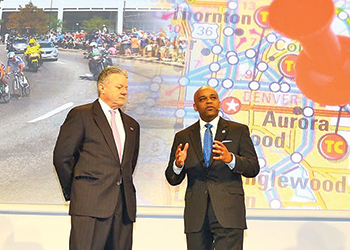 A key announcement from the show was a partnership between Panasonic and the city of Denver, which will use Panasonic smart technology to help improve energy efficiency, water conservation, public safety, health care and other public service areas.